Six different covers featuring, individually, Gwendolyn Christie, Natalie Dormer, Emilia Clarke, Lena Hedey, Sophie Turner and Maisie Williams. Season 6 of Game of Thrones debuts April 24. To satiate fans of the HBO series in the meantime, Entertainment Weekly is following a model that print magazines are wisely and increasingly relying upon: multiple “Collector’s Edition” covers for the same single issue. Thanks to the six-cover split, each actress stands next to the same clever cover line, “Dame of Thrones.” The others featured in the series are Emilia Clarke (Daenerys Targaryen), Lena Headey (Cersei Lannister) and Natalie Dormer (Margaery Tyrell). 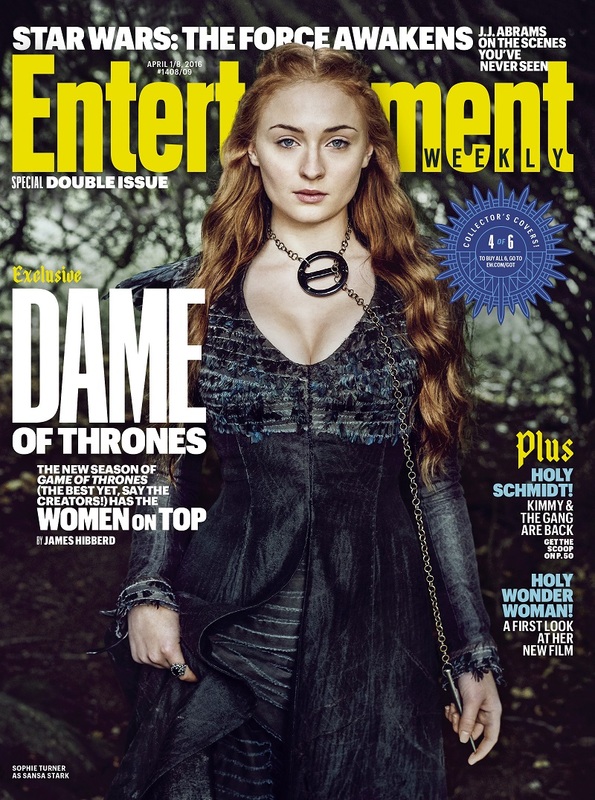 An even-split run of the six “Dame of Thrones” covers is being distributed to both EW subscribers and newsstands starting March 25. The covers can also be ordered online here.